Do you have high quality data and can it be seamlessly shared among clinical and administrative systems to power actionable analysis? For many of you the answer is likely “no”, according to a recent survey of healthcare managers conducted by the research unit of SouceMedia, publisher of Health Data Management, on behalf of Informatica. The quality of your data and the ability to integrate it across myriad systems is essential to measuring patient outcomes and improving engagement: two key components to success in a value driven world. 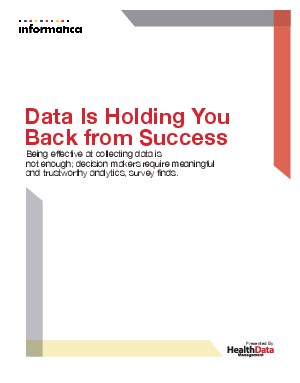 While survey respondents said they are effective at collecting financial, clinical and operational data, they acknowledge that they struggle to access and trust the data in order to fuel process management. Download the whitepaper and learn about the survey results and what you can do to differentiate yourselves now!